Hansel and Gretel slot is the second installment in NetEnt’s Fairytale Legends series of games and an even better game than its predecessor, Red Riding Hood slot. With a bundle of in-game bonus features this is one of the best games to come out in 2017. Hansel and Gretel Slot is part of the celebrated NetEnt Fairytale Legends series of games. It builds on the popularity of the Red Riding Hood slot machine and introduces some new features to further enhance the fun factor. The game is very similar to its predecessor, which means that players who had the chance to spin its reels will appreciate the consistent approach. There are several differences between the two games and the wild respins pay better, while the number of bonus game features was also increased. 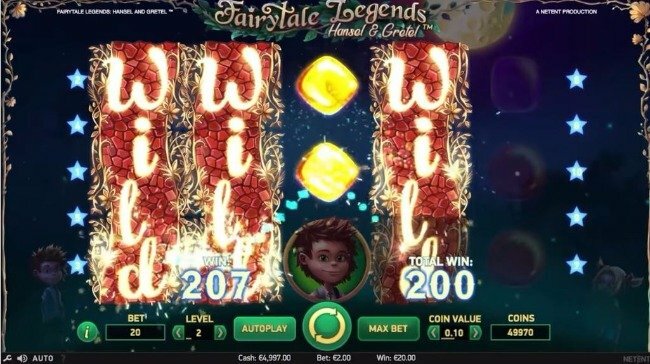 Hansel and Gretel slot machine has only 10 pay lines, twice as few as its predecessor, but introduces stacked wilds. Their sticky counterparts had to go to make room for these better looking wild symbols which also have the merit of paying more on single pay lines. For the first time in the Fairytale Legends series, three contiguous symbols produce a winning pay line. The bottom line is that the new wild symbols will keep players at the edge of their seats and reward them lavishly when they hit a big winning combination. How to play Hansel and Gretel Slot? Hansel and Gretel video slot is easy to play regardless of your previous experience with the first game in the series. The game has a mix of original features centered on the idea that players should be given the chance to spin the reels for free as many times as possible. The original theme is inspired by the Hansel and Gretel story, and perfectly fits with NetEnt’s vision of a fairytale series. The game has five reels and 10 pay lines and a house edge of only 3.29%, which means that you don’t have to be very lucky to win. Compared to other games produced by the Scandinavian software developer, this one has medium volatility. Those who play Hansel & Gretel can bet between 0.10 and 200 units, with the coins range of 0.01 – 2.00. This makes it a great choice for highrollers and those who have greater expectations from slot machines, as it can produce maximum payout of 80,000 units. Amateurs are also likely to be impressed by its visuals and amazing animations whenever a winning combination is triggered. The Hansel and Gretel slot has a total of 7 bonus features, with three of them being randomly triggered. These have the merit of pleasantly surprising players when they least expect it and they can be activated after any spin. One doesn’t have to bet a larger amount to have a shot at triggering one of the three random features. By comparison, the stacked wilds and re-spins feature is more elusive, but it remains the most coveted of all bonus rounds. Players who are lucky enough as to hit the scatter symbol depicted by a treasure chest will activate one of the three classic bonus rounds. One of them will award instant cash, another is responsible for triggering free spins and the third will mark the beginning of a cool minigame. The wild symbol is depicted by the by the red brick road and it can appear stacked on the second and fourth reels. If it gets to cover the entire reel, players have the opportunity of claiming a wild re-spin. It makes it possible to get stack of wilds on all five reels except for the third, therefore increasing the number of winning combinations. For as long as the stacked symbols cover the reels, players will keep collecting re-spins. Compared to other games and also its predecessor, the Hansel and Gretel slot has free spins re-triggered far more often. Stacked Wild Respins, Fairy Wonder Spin, Fairy Surprise, Fairy Wild Spin, Candy House Bonus Game are the popular Hansel and Gretel bonus games. They have the upside of paying anywhere on the reels. This means that players will not have to go through those frustrating situations in which the bonuses appear on the wrong reels. The potential payouts depend on how much money players chose to wager before the bonus rounds begin. Fairy Surprise helps players get over unlucky spins much easier, by creating winning combinations out of random low paying symbols. It is more than a consolation prize and when it pops up on the reels, it can completely offset the losses suffered during the previous round. Fairy Wild Spin is arguably the best of all fairies as it triggers an avalanche of payouts by producing two wild reels. On top of this, players will also benefit from one wild respin, which can in turn produce further wins. The instant cash Hansel and Gretel bonus game is the easiest to claim, but also the least exciting. This is a one trick pony that does one thing and one thing only. It will increase the profits up to 20 times, with an average return on investment of 10 times the bet. Compared to the other bonuses and special rounds, this one is the least unique, but nevertheless lucrative. 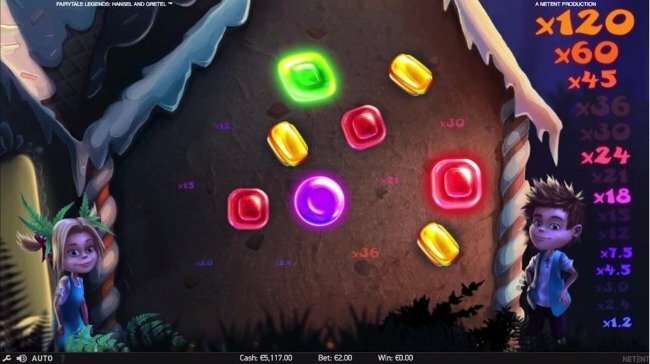 The Hansel and Gretel free spins bonus is also triggered by the treasure chest appearing on the screen. When this happens, players get stacked wilds on the first, second fourth and fifth reels and also an additional two free spins. The worst-case scenario is to collect the minimum bundle of 10 free spins, but usually players collect up to 14 or more. Another popular Hansel and Gretel bonus game goes by the name of Candy House. In addition to the sheer fun of claiming additional cash, this bonus has the advantage of being highly interactive. Players need to choose three pieces out of a total of 15 candies and each of them corresponds to a multiplier. Depending on how inspired players are when picking candy, they can win more or less money. There is also the possibility of cutting down on risks by choosing to claim the guaranteed average of the three. Don’t forget the random Hansel and Gretel bonuses, which are triggered by some iconic symbols. 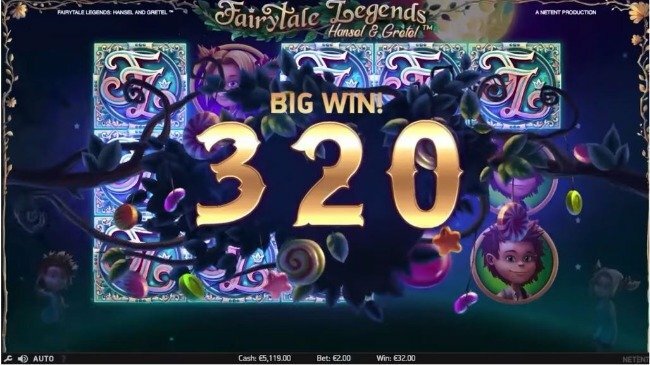 Fairy Wonder Spin is a pleasant sight whenever it appears on the reels, as it has the merit of bringing up to nine Hansel and Gretel slot logos on the screen. They provide a single opportunity for players to spin the reels, but keep in mind that this is the best paying symbol. Since it has the uncanny ability of paying regardless of where it appears on the reels, you’d have to be terribly unlucky not to get paid. Hansel and Gretel video slot proudly continues the Fairytale Legends series, after the original game set the bar so high. It is easier than ever to produce winning combinations, since adjacent symbols produce payouts on any pay line. The addition of stacked wild at the expense of sticking ones will also boost winnings, while paying more often. In this regard, the second installment in the series is vastly superior to Red Riding Hood. When it comes to the theme chosen, it brilliantly succeeds at capturing the very essence of the fairytale. All in all, it is another amazing NetEnt game easy to recommend to slots fans.